Mar 4, 2015 - SF molecular with the pericellular coating of the keloid fibroblasts, the addition of the ... enhanced adhesive targeting to the keloids fibroblasts. for effective massage-like transdermal drug delivery. ... It was assumed that with massage, the ... of its water-retaining, skin-adhesive, and anti-inflammatory. Aug 16, 2011 - and Application in the Controllable Hydrolysis of Sericin. Lin Zhu,. â . Ren-Ping Hu,. â ... vantages; for example, the free enzyme is difficult to refine and store and cannot be ..... [email protected] Author Contributions. potential, for instance, in the stimulation of glucose transport in normal and insulin-resistant 3T3-L1 adipocytes15 or in the proliferation of fibroblasts in wound healing models.11 Kim et al also reported the anti-inflammatory activity of fibroin peptides in a mice edema model of inflammation.16 These effects were associated with the decrease of cyclooxygenase-2, interleukin (IL)-6, IL-1β, and tumor necrosis factor (TNF)-α levels in the inflamed tissue. 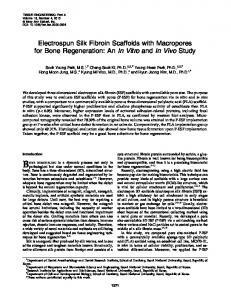 In addition, silk fibroin has also shown beneficial effects on wound healing in vivo,17 through upregulation and phosphorylation of c-Jun, a protein responsible for the migration of keratinocytes in wound healing models.18 The aim of the present study was to test the intestinal anti-inflammatory effects of fibroin nanoparticles (FNPs) loaded with resveratrol on the trinitrobenzene sulphonic acid (TNBS) experimental model of rat colitis, which resembles human IBD.19 The combination of the good qualities of fibroin as a delivery vector and the anti-inflammatory and healing effects of its peptides could enhance the therapeutic action of the drug. Resveratrol is a stilbene compound, present in many plant species, with excellent antioxidant, anti-inflammatory, antiviral, and antitumor properties20,21 but with a low bioavailability, which could be improved by nanoparticle delivery. We tested the anti-inflammatory effects of FNPs, either unloaded or loaded with resveratrol, and compared them with a widely used anti-inflammatory drug, the glucocorticoid dexamethasone. Special attention was paid to their effects on the expression of some of the mediators involved in the inflammatory response, such as proinflammatory cytokines (IL-1β, TNF-α, IL-6, and IL-12), chemokines (cytokine-induced neutrophil chemoattractant [CINC]-1 and monocyte chemoattractant protein [MCP]-1), and adhesion molecules (intercellular adhesion molecule [ICAM]-1), as well as different markers of epithelial integrity in the mucosa, like the mucins MUC-2 and MUC-3, and the proteins trefoil factor (TFF)-3 and villin. In addition, the effects of resveratrol-loaded FNPs (RL-FNPs) were tested in vitro in RAW 264.7 cells (mouse macrophages). RL-FNPs showed immunomodulatory properties and had a better intestinal anti-inflammatory effect than the single treatments, being similar to that obtained with the glucocorticoid dexamethasone. Materials and methods Materials Silk fibroin was obtained from silkworms reared in the sericulture facilities of the Instituto Murciano de Investigación y Desarrollo Agrario y Alimentario (Murcia, Spain). All reagents, including resveratrol (99% purity, fine crystalline powder), were purchased from Sigma-Aldrich Corp (St Louis, MO, USA). Preparation of reconstituted liquid silk fibroin Cocoons were boiled twice for 45 minutes in aqueous 0.02 N Na2CO3 and then rinsed thoroughly with water to extract the glue-like sericin proteins. The raw silk fibroin was then dried at room temperature for 72 hours before being dissolved at 10% (w/v) in Ajisawa’s reagent22 – composed of CaCl2/ ethanol/H2O (1:2:8, molar ratio) – for 6 hours at 70°C (avoiding boiling). The silk solution was dialyzed for 48 hours against distilled water, to remove CaCl2, smaller molecules, and some impurities, using a cellulose semipermeable membrane (cutoff 12 kD). Preparation of silk FNPs FNPs were prepared by nanoprecipitation in MeOH.10 Briefly, 10 mL of 4% (w/v) silk fibroin aqueous solution was dropped into 90 mL of cold MeOH with gentle stirring. The resulting suspension of nanospheres was stirred for 2 hours. Then, nanoparticles were recovered by centrifugation at 18,500 g for 15 minutes at 4°C (Eppendorf Centrifuge 5810R, equipped with a F-34-6-38 rotor; Eppendorf AG, Hamburg, Germany), washed with water, and lyophilized. They were stored at room temperature in a desiccator until use. as the difference between the drug added in the loading solution and the drug content remaining in solution after incubation with FNPs. All experiments were performed in triplicate. The release rate of resveratrol from the silk FNPs in phosphate-buffered saline (PBS) was also evaluated. Briefly, 25 mg of dried RL-FNPs were dispersed in 25 mL of PBS 1× (pH 7.4) in a 50 mL Falcon™ tube and then maintained at 37°C with gentle agitation. At different times of incubation, samples were centrifuged until the supernatants were clear, and then aliquots of 150 μL of supernatant were withdrawn from the incubation medium, centrifuged at 18,000 g to remove residual FNPs, and measured for resveratrol concentration as described above. Samples were diluted to the calibration range (0.5–25 μg/mL) with ethanol (ethanol/PBS 9:1). Each assay was performed in triplicate, including a negative control of PBS without RL-FNPs. After sampling, an equal volume of fresh PBS was immediately added to the incubation medium. The amount of resveratrol released from the nanoparticles was expressed as a percentage of the total resveratrol loaded in the nanoparticles and was plotted as a function of time. All results are expressed as the mean ± standard error of the mean (SEM). Differences between means were tested for statistical significance using a one-way analysis of variance (ANOVA) and post hoc least significance tests. Differences between proportions were analyzed with the chi-squared test. All statistical analyses were carried out with GraphPad Prism version 5.0 (La Jolla, CA, USA), with statistical significance set at P0.05. Abbreviations: CINC, cytokine-induced neutrophil chemoattractant; FW, forward; GADPH, glyceraldehyde-3-phosphate dehydrogenase; ICAM, intercellular adhesion molecule; IL, interleukin; MCP, monocyte chemoattractant protein; MUC, mucin; PCR, polymerase chain reaction; RV, reverse; T, temperature; TFF, trefoil factor; TNF, tumor necrosis factor. Particle size (µm) Figure 1 Particle size distribution (%) of FNPs and RL-FNPs. Abbreviations: FNP, silk fibroin nanoparticle; RL-FNP, resveratrol-loaded silk fibroin nanoparticle. DLC and EE of resveratrol in the nanoparticles were 11.6%±0.2% (2.89 mg of resveratrol loaded in 25 mg of FNPs) and 33.3%±0.2%, respectively. The DLC obtained is similar to that found by Shao et al29 in a polyethyleneglycolpolycaprolactone copolymer (PEG/PCL), mPEG4k–PCL20k, with a loading content of resveratrol near to 20%, but the EE in our study was far below their value (more than 90%). Although it is difficult to compare the properties of different materials, such as silk and PEG/PCL copolymer, this low efficiency reached by the FNPs is probably due to the hydrophobicity of resveratrol.29 The amount of resveratrol loaded in the particles was a function of its concentration in the incubation solution, the maximum loading being reached at a concentration of 25 mg/mL in ethanol. Release of resveratrol from RL-FNPs the particle surface by the resveratrol adsorbed in the FNPs. The SEM images show nanoparticles as discrete particles and RL-FNPs as aggregates (Figure 2). Resveratrol crystals were found over the surface of the aggregates as an artefact of sample preparation for SEM capture. FTIR spectroscopy IR spectra of the different FNPs were recorded in order to confirm that resveratrol was successfully incorporated into the nanoparticles and the structural conformations of the protein. The analysis was focused in the region ranging from 2,000–500 cm-1 (Figure 3), the most useful for detection of the characteristic absorption peaks of the aromatic rings of resveratrol and the silk fibroin amides. The FTIR confirmed that resveratrol was successfully incorporated onto the nanoparticles since its characteristic peaks (at ~1,000 and ~1,300 cm-1) could be differentiated from the background of nanoparticles (Figure 3). Amide regions showed the characteristic peaks of the β-sheet conformation, as reported by Zhang et al10 denoting a water-insoluble protein in these cases. Resveratrol has very low solubility (0.11–0.3 mg/L) in aqueous media (simulated intestinal fluid or PBS).30 Our RL-FNPs showed curves of liberation with an initial burst, reaching resveratrol saturation of the aqueous medium in 3–4 hours and maintaining a resveratrol concentration higher than 15 mg/L in PBS medium over a period of 80 hours. Considering a volume of 25 mL of PBS, 0.5 mg of resveratrol was released initially until medium saturation was reached. Taking into account that the DLC of FNPs is about 12%, less than 20% of the loaded resveratrol was released in the initial burst. Adsorbed resveratrol was stable upon degradation, and the RL-FNPs showed a prolonged release over 80 hours (Figure 4). Notes: D(0.1), D(0.5), and D(0.9) are standard percentile readings from the analysis. D(0.1) (nm) is the size of particle below which 10% of the sample lies; D(0.5) (nm) is the size in microns at which 50% of the sample is smaller, and 50% is larger. This value is also known as the mass median diameter (MMD); D(0.9) (nm) is the size of particle below which 90% of the sample lies. Abbreviations: DLS, dynamic light scattering; FNP, silk fibroin nanoparticle; RL-FNP, resveratrol-loaded silk fibroin nanoparticle. Figure 2 SEM images of: (A) FNPs (magnification 15,000×); (B) RL-FNPs (5,000×); (C) RL-FNPs (15,000×); and (D) detail of resveratrol crystals (5,000×) grown on the surface of aggregated RL-FNPs during sample deposition for SEM capture. Abbreviations: FNP, silk fibroin nanoparticle; RL-FNP, resveratrol-loaded silk fibroin nanoparticle; SEM, scanning electron microscope. Wavenumber (cm–1) Figure 3 Comparative FTIR spectra of resveratrol (top), RL-FNPs (middle), and FNPs (bottom). Abbreviations: FNP, silk fibroin nanoparticle; FTIR, Fourier transform infrared; RES, resveratrol; RL-FNP, resveratrol-loaded silk fibroin nanoparticle; T, transmittance. Time (hours) Figure 4 Release of resveratrol from RL-FNPs in 25 mL of PBS 1× (pH 7.4) over a period of 80 hours. Abbreviations: PBS, phosphate-buffered saline; RES, resveratrol; RL-FNP, resveratrol-loaded silk fibroin nanoparticle. Figure 5 Production of nitrite in RAW 264.7 cells after exposure to different doses of resveratrol, RL-FNPs, and unloaded FNPs. (A) Reaction without exposure of cells to LPS. (B) Reaction with exposure of cells to LPS. Abbreviations: FNP, silk fibroin nanoparticle; LPS, lipopolysaccharide; RL-FNP, resveratrol-loaded silk fibroin nanoparticle. extent than with the nanoparticles alone. In addition, resveratrol was also able to significantly increase the nitrite production in basal conditions, when compared with the corresponding control, although no concentration-dependent effect was obtained. When RAW 264.7 macrophages were incubated with LPS, enhanced production of nitrite took place, as well as its accumulation in the culture media, due to increased expression of iNOS in these cells (Figure 5B). The pretreatment with resveratrol-unloaded nanoparticles did not significantly modify nitrite levels in comparison with control conditions, whereas RL-FNPs, at concentrations of 250 and 500 μg/mL, were able to reduce nitrite production. This inhibition was similar to that obtained when resveratrol was assayed at the lowest concentration studied but lower than those achieved when the macrophages were incubated with higher concentrations of resveratrol (Figure 5B). intestinal anti-inflammatory effect, the exception being those colitic animals that received resveratrol alone. This beneficial effect was evidenced by a significant reduction of the colonic weight/length ratio in comparison with the nontreated group, which indicates an improvement of the edema associated with the inflamed tissue (Table 3). At the same time, a significant reduction in the length of the inflamed/ulcerated colonic tissue was observed 8 days after the administration of TNBS, with lower values in the macroscopic score (Table 3). It is interesting to note that the effect of the FNPs, alone or loaded with resveratrol, was similar to that obtained with the intracolonic administration of dexamethasone (Table 3). The beneficial effect shown macroscopically was also evident in the evaluation of the different biochemical parameters in the colonic tissue. The treatment of the colitic animals with the nanoparticles, alone or resveratrolloaded, was associated with a significant reduction of the activity of the colonic MPO, probably due to a lesser infiltration of leukocytes into the inflamed tissue (Table 3). However, it is important to note that the reduction was significantly higher when the nanoparticles were loaded with resveratrol, showing a similar activity to dexamethasone (Table 3). At the same time, the treatment with the RLFNPs significantly increased the glutathione content, which indicates an improvement of the altered oxidative state that was the result of the inflammatory process induced by the TNBS, showing significant differences from the group of animals that received the unloaded nanoparticles. Again, this effect was similar to that observed in the group of rats that received dexamethasone (Table 3). Notes: Data are expressed as mean ± SEM. Groups with a different letter (a–d) differ statistically (P0.05). #8 mg of RL-FNPs, loaded with 1 mg of resveratol. Abbreviations: FNP, silk fibroin nanoparticle; GSH, glutathione; MPO, myeloperoxidase; RL-FNP, resveratrol-loaded silk fibroin nanoparticle; SEM, standard error of the mean; TNBS, trinitrobenzene sulphonic acid. epithelial barrier was observed also in the group of colitic animals treated with the glucocorticoid dexamethasone, supporting the similar intestinal anti-inflammatory effect obtained with both treatments (Figure 8). Figure 6 Effects of unloaded FNPs, resveratrol, RL-FNPs, and dexamethasone on colonic gene expression, in TNBS rat colitis, of the cytokines (A) IL-1β, (B) IL-6, (C) TNF-α, and (D) IL-12, analyzed by real-time PCR. Notes: PCR data are expressed as mean ± SEM (n=10). Groups with a different letter (a–d) differ statistically (P0.05). Abbreviations: Dex, dexamethasone; FNP, silk fibroin nanoparticle; IL, interleukin; PCR, polymerase chain reaction; Resv, resveratrol; RL-FNP, resveratrol-loaded silk fibroin nanoparticle; SEM, standard error of the mean; TNBS, trinitrobenzene sulphonic acid; TNF, tumor necrosis factor. Figure 7 Effects of unloaded FNPs, resveratrol, RL-FNPs, and dexamethasone on colonic gene expression, in TNBS rat colitis, of the chemokines (A) CINC-1, (B) MCP-1, and (C) the adhesion molecule ICAM-1, analyzed by real-time PCR. Notes: Data are expressed as mean ± SEM (n=10). Groups with a different letter (a–c) differ statistically (P0.05). Abbreviations: CINC, cytokine-induced neutrophil chemoattractant; Dex, dexamethasone; FNP, silk fibroin nanoparticle; ICAM, intercellular adhesion molecule; MCP, monocyte chemoattractant protein; PCR, polymerase chain reaction; Resv, resveratrol; RL-FNP, resveratrol-loaded silk fibroin nanoparticle; SEM, standard error of the mean; TNBS, trinitrobenzene sulphonic acid. Figure 8 Effects of unloaded FNPs, resveratrol, RL-FNPs, and dexamethasone on colonic gene expression, in TNBS rat colitis, of the mucins (A) MUC-2 and (B) MUC-3, as well as of (C) TFF-3 and (D) villin, analyzed by real-time PCR. Notes: Data are expressed as mean ± SEM (n=10). Groups with a different letter (a–c) differ statistically (P0.05). Abbreviations: Dex, dexamethasone; FNP, silk fibroin nanoparticle; MUC, mucin; PCR, polymerase chain reaction; Resv, resveratrol; RL-FNP, resveratrol-loaded silk fibroin nanoparticle; SEM, standard error of the mean; TFF, trefoil factor; TNBS, trinitrobenzene sulphonic acid. and to delay drug release to the distal intestine, are needed in order to allow the oral administration of this nanoparticulate formulation. Junta de Andalucia; J Garrido-Mesa is a predoctoral fellow of the Spanish Ministry of Education, Culture and Sport; N Garrido-Mesa is a postdoctoral fellow of the Ramon Areces Foundation; ME Rodríguez-Cabezas is a postdoctoral fellow of Centro de Investigaciones Biomédicas en Red – Enfermedades Hepáticas y Digest (CIBER-EHD), which is funded by the Instituto de Salud Carlos III. Lozano-Pérez et al 40. Wang Y, Srinivasan K, Siddiqui MR, George SP, Tomar A, Khurana S. A novel role for villin in intestinal epithelial cell survival and homeostasis. J Biol Chem. 2008;283(14):9454–9464. 41. Neurath MF, Travis SP. Mucosal healing in inflammatory bowel diseases: a systematic review. Gut. 2012;61(11):1619–1635. Journal Citation Reports/Science Edition, EMBase, Scopus and the Elsevier Bibliographic databases. The manuscript management system is completely online and includes a very quick and fair peer-review system, which is all easy to use. Visit http://www.dovepress.com/ testimonials.php to read real quotes from published authors. 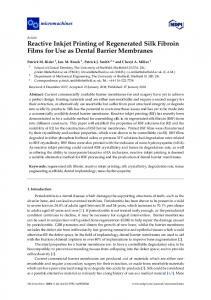 Report "Silk fibroin nanoparticles constitute a vector for ... - Semantic Scholar"